The Artful Maven: A Sharp Distressed Man??? Hello Crafters! 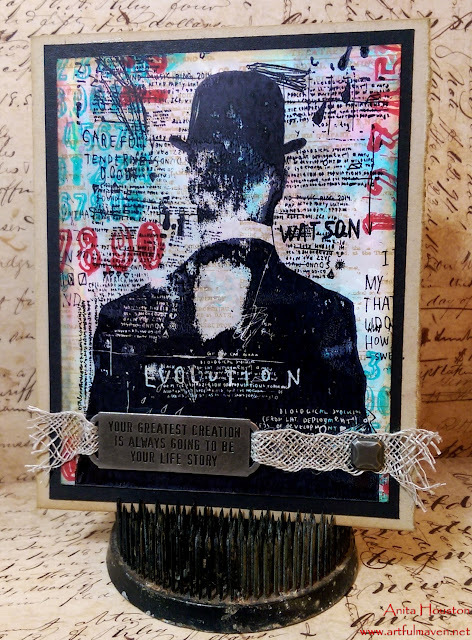 Today, I have a bevy of cards to show you using Tim's new gent stamps from Stamper's Anonymous. I LOVE all the images...so artsy and so masculine! And, I wanted to show you how versatile Ranger's Specialty Stamping Paper is...it is capable of really getting wet! Hope you enjoy this artsy twist on a theme! 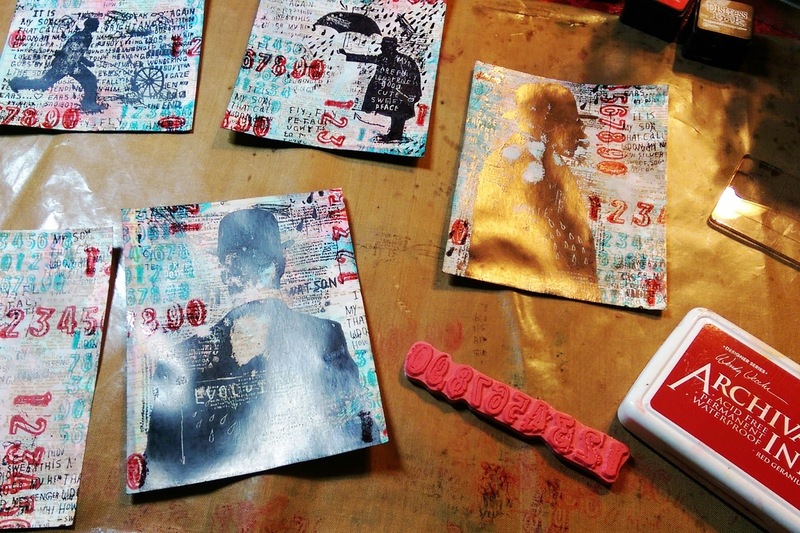 A lot of my students think that Specialty Stamping Paper is only for super crisp stamping. It's not! It can take a whole variety of mediums, and then still make super stamped images once it's dry. For that reason, it is my most favorite paper...REALLY! It makes the greatest 3D type layers too, and they stay that way, even with Distress Ink. 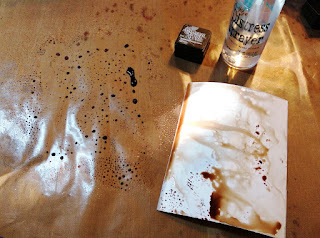 To make the first layer, I applied Ground Espresso Distress Ink directly to my craft sheet, then I misted it with water. I laid my paper in, and dragged a little. Then I gave this a dry with the heat tool back and front. 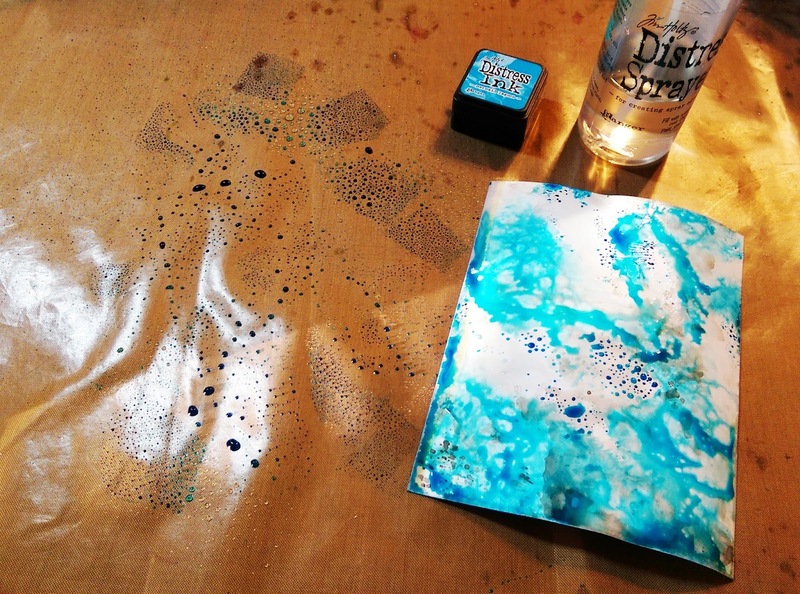 For layer two, I added Mermaid Lagoon Distress Ink to the craft sheet, and repeated the steps above. Adding the second layer DID NOT move any of my ink from the first layer. It's like the card absorbs it, and it stays put. All the designs are still there! When I discovered this, I was blown away...I LOVE this paper! It's genius! To make the third layer, I added Candied Apple to the craft sheet, and repeated again. All three layers melded nicely...there is no mud...just a layered 3D look! 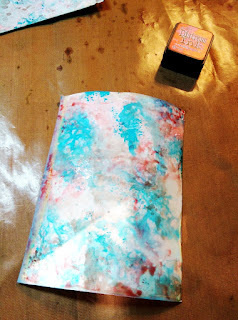 This paper is great for marbling! Sheer geniousness! Then I started stamping. I stamped the new Newsprint image in Wendy's Tree Branch Archival Ink, and gave that a dry. You must dry every layer you put on, so it doesn't smear. 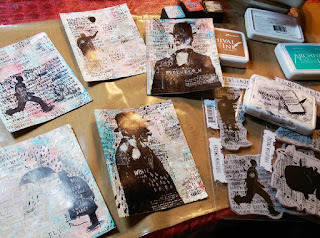 Then I stamped all the images from Evolution and Sideshow...great names...in Jet Black Archival. The surface of the table was very sturdy, so my images weren't solid, BUT I LOVED that, because the under layers came through in spots. It was perfect for these artsy cards. 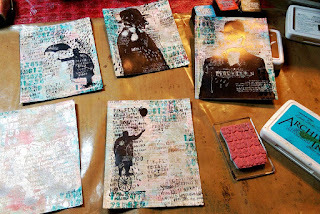 Then I stamped the numbers from the Sideshow set in Forget Me Not, and dry this. Then I stamped even more with Red Geranium. All the images are super crisp. 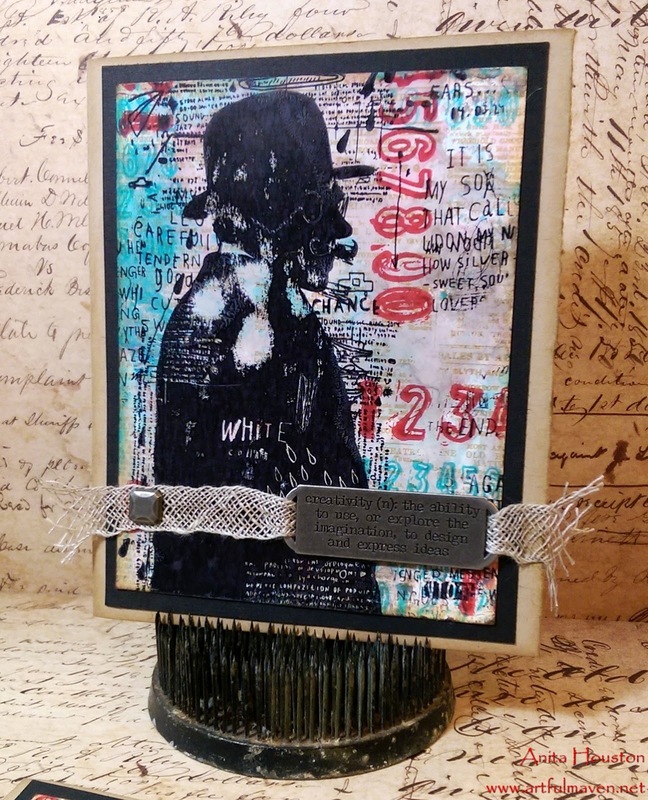 Then to finish the cards, I mounted them on cardstock and a kraft base, and added Linen Ribbon, Nailheads (LOVE), and a Quote Band. 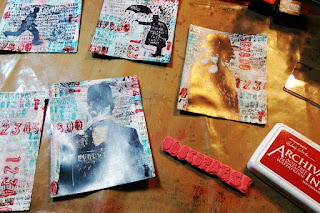 Isn't Specialty Stamping Paper the bomb?!! Aren't these images great?!! I LOVED Tim's whole line this year...very masculine...which is why I fell in love with his style so many years ago! Thanks Tim! I'm off to Boston today for the Collins Group Spring Show. I'm even teaching there, so please wish me luck teaching those store owners...yikes!!! Anita! You have ROCKED these!! I love the colour scheme, love those stamps!! FABULOUS!! These are freakin' awesome Anita! I love this set, your loaded background and those stamps. How fun! I just got this stamp set and I love what you've done with it Anita, these are fabulous!! Wow Anita! All cards are stunning! 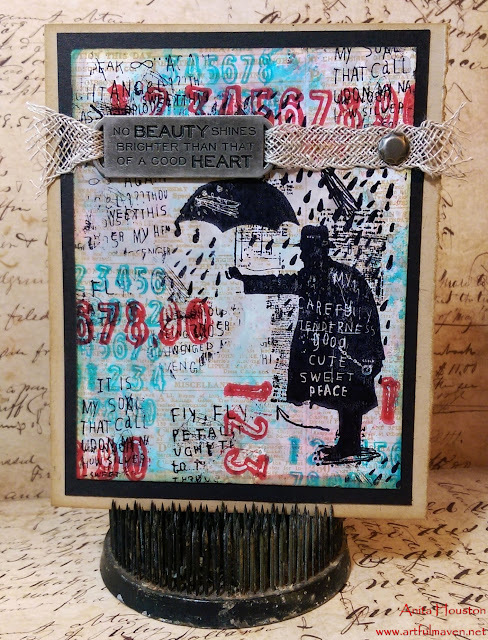 I love your backgrounds and your stamping too. They are very artistic, indeed! Yes, these are artsy cool! Great tip on working with the paper. Such cool cards! What a delightful mix! Love how you use the same colors, but each image gives a different feel! You are spot on - awesome stamp set!! LOVE your creations.....have fun in BOSTON! I love that city! hugs! Oh yes! 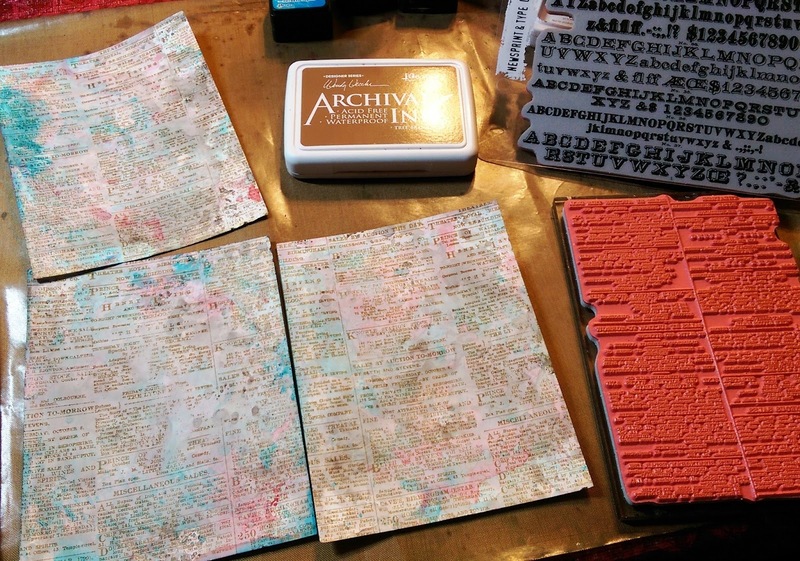 You have done some amazing things with these stamps and that paper. Soooo artsy. Have fun in Boston! oh wow wow wow - fantastic your art with the new images!!!!!! OH MY FRIEND!! you are so awesome! I absolutely love these...now I need them!! I wish I was there this weekend to take your class!! miss me okay!! Love these cards, Anita - I've got my stamps on pre-order and now I can't wait to play! Anita! These cards are fabulous! Love those images, you did a great job of mixing colors without making mud. Fantastic!! Your cards are awesome, Anita. 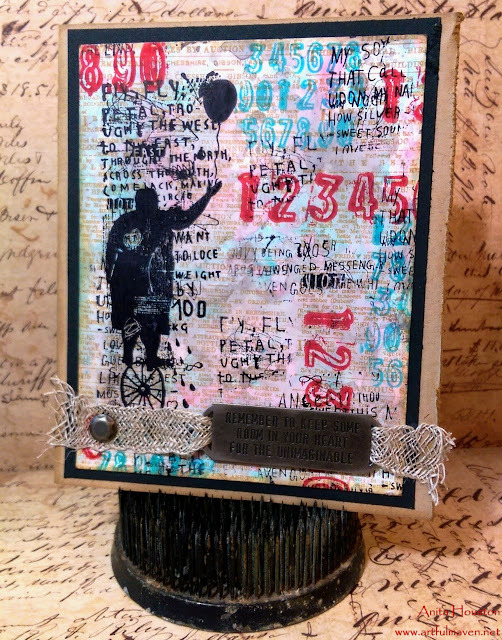 Great information about the specialty stamping paper...thanks! Your designs are very cool and you really used those stamps so well. Loving all the layers and details in these pieces. 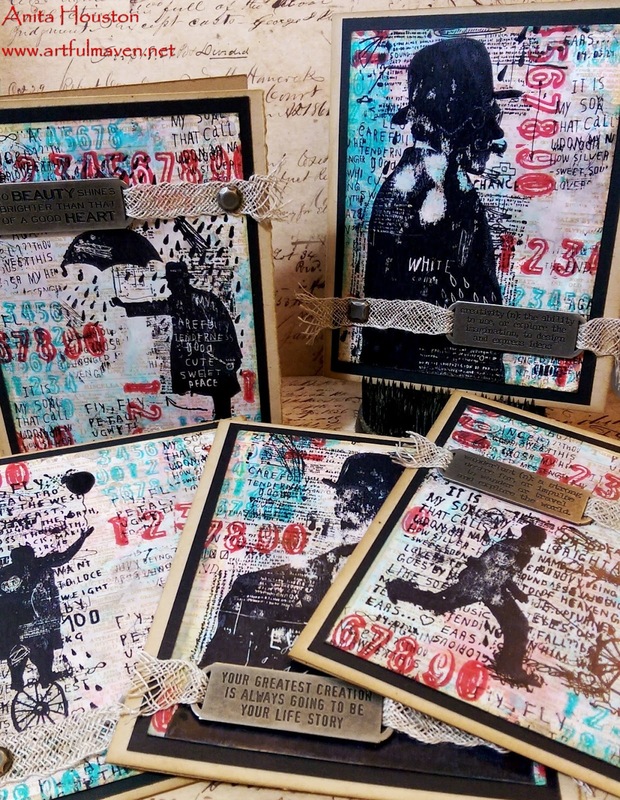 I LOVE the artsy feel of these stamps and your color scheme is FANTASTIC too. Blessings! Oh my WORD!!! 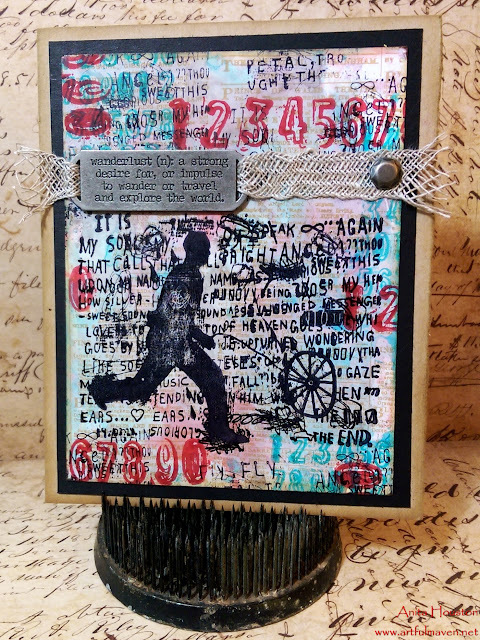 I was talking to Carolyn (I took one of Dina's classes, at The Crafty Scrapper, the other day) when she told me I just HAD to come visit your blog to see what you've done, with Tim's new stamps! I was ready to be excited about the stamps, but what you've done, here!! I am head over HEELS! Now, I REALLY can't wait for them to arrive! Fantastic work!! !